Recently, Dr. Rebecca Stoltzfus was inaugurated as Goshen College’s 18th president. Dr. Stoltzfus has an incredible work and academic history, so there is no question as to why she was elected. 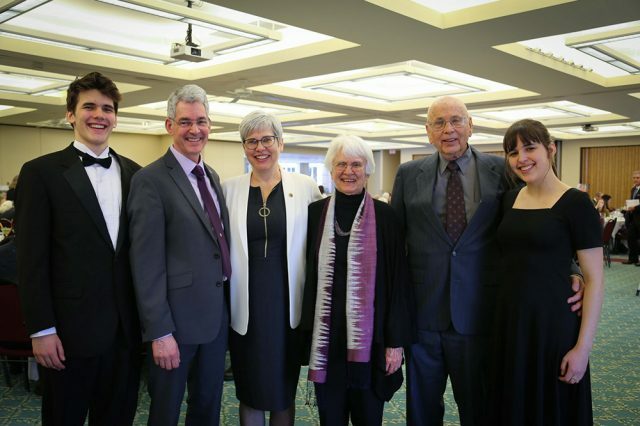 Even with the busy lifestyle that she now has, Dr. Stoltzfus still has a loving and supportive family by her side, but who exactly is GC’s presidential family? Dr. Stoltzfus is married to Kevin Miller, a 1985 Goshen College graduate. They are the parents of Lydia and Gabe Miller, both current GC students. Gabe is a sophomore majoring in sustainable food systems with a minor in music and Lydia is a senior majoring in math. From the moment they found out Dr. Stoltzfus was a candidate to the time she was elected as president, the whole family was filled with excitement and hope. “It was a lot of excitement… To be honest, from the beginning I knew that she would have a good chance of getting it,” Gabe said. “I was so thrilled… I was trying to hold back the excitement because I didn’t want to be too disappointed if she didn’t get it,” Lydia said. Although their parents were thrilled by the news, Lydia did notice that it was more bittersweet for them because they had to leave Ithaca, New York, a place that they had become strongly connected to. “I think that it was more bittersweet for them more then it was for me and Gabe because they are so connected to Ithaca and to our home there, and my mom’s job at Cornell was going really well, but they were also so thrilled and so excited… they wouldn’t have given up what they had if this wasn’t just amazing,” she said. The family knew that some things would change if and when Dr. Stoltzfus became president of GC, and during the whole process they all had conversations about this. As parents, Dr. Stoltzfus and her husband made sure that Gabe and Lydia were included. “She made it very clear that it was something that was not just her decision to make. She was very aware of how it would affect us and wanted to know what our thoughts were,” Gabe said. Now that Gabe and Lydia’s mom is GC’s president, some things have changed, but they are very excited and proud of their mom and the work she will be doing at the college they are both attending. “It’s a dream. I love it. I’m kind of in disbelief at how wonderful it’s been so far. It feels so good to show her off to the world,” Lydia said. Although everyone in the family maintains busy schedules, they still try to find time to get together, especially now that they live closer. A typical weekend routine for GC’s presidential family includes competitive games of Boggle or a family dinner. The whole family is very supportive of each other. Gabe and Lydia admire their parents in many ways and are motivated by the work that they both do in their careers and as parents. “They’ve always done a good job of making us feel like we can pursue whatever goals we have,” Gabe said. “They’ve been very supportive… It makes me want to work hard. It makes me want to be successful. “[My mom is] an incredibly inspiring figure. It’s a cool thing to have one of your parents in that role… [My dad is] an amazing listener… He’s constantly trying to learn and grow,” he said. “I really admire the way that my mom takes questions and challenges in her work seriously… and [that she] takes the people that she is working with seriously… [My dad is] a very comforting presence, he helps make things right. He’s a really strong support and so smart, and I always feel like I can rely on him,” Lydia said. The presidential family at Goshen College is no different than any other. Although Gabe and Lydia’s mom is the president at their college, they still want to feel and be treated like other students. They are aware of the responsibilities that comes with their mom’s new position, but the values and encouragements they receive from their parents are always on their mind.